In this lesson, we will learn how to find the equation of a circle using its center and a given point. A circle has centre ( 2 , 2 ) and goes through the point ( 6 , 3 ) . Find the equation of the circle. Determine the equation of a circle that passes through the point 𝐴 ( 0 , 8 ) if its centre is 𝑀 ( − 2 , − 6 ) . A circle has centre ( 4 , − 2 ) and goes through the point ( − 2 , − 3 ) . Find the equation of the circle. What is the equation of the circle of centre ( 3 , 4 ) and passing through ( 7 , 7 ) ? A circle has centre  2 3 , − 2 5  and goes through the point ( − 3 , 5 ) . Find the equation of the circle. A circle centered at the origin goes through the point (1, 1). Work out the equation of the circle. Determine the positive value of 𝑦 when 𝑥 = 1 2 . Is the point  1 2 , √ 7 2  on the circle? Determine the equation of a circle whose centre is at the point 𝑀 ( 4 , − 3 ) , given that the circle touches the straight line 𝑥 = 1 0 . The given figure shows a circle with center 𝑂 ( 𝑥 , 𝑦 )   and a point 𝐴 ( 𝑥 , 𝑦 ) lying on the circumference of the circle. Find the length of 𝑂 𝐵 in terms of 𝑥 and 𝑥  . Find the length of 𝐴 𝐵 in terms of 𝑦 and 𝑦  . Using the Pythagorean Theorem, express 𝑟  in terms of the lengths of 𝑂 𝐵 and 𝐴 𝐵 . Find the radius of the circle that passes through point ( − 3 , − 2 ) and has centre ( − 5 , 8 ) . Does the coordinate ( 3 , − 1 ) lie on the circle centred at the point ( 2 , − 2 ) passing through the point ( 1 , − 1 ) ? C We need more information in order to work it out. Determine the equation of a circle that passes through the point 𝐴 ( 5 , 1 0 ) if its centre is 𝑀 ( 6 , 9 ) . 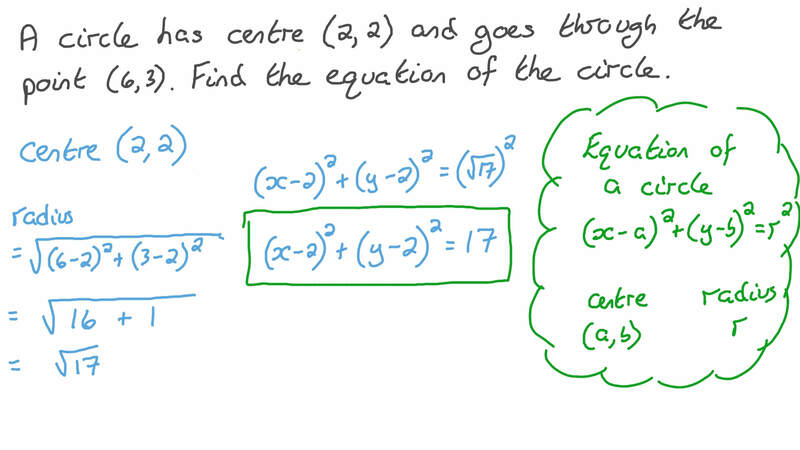 Determine the equation of a circle that passes through the point 𝐴 ( 5 , − 1 0 ) if its centre is 𝑀 ( 2 , − 4 ) . Determine the equation of a circle that passes through the point 𝐴 ( 1 , 3 ) if its centre is 𝑀 ( 1 0 , − 3 ) . Determine the equation of a circle that passes through the point 𝐴 ( 8 , − 2 ) if its centre is 𝑀 ( 5 , − 8 ) . 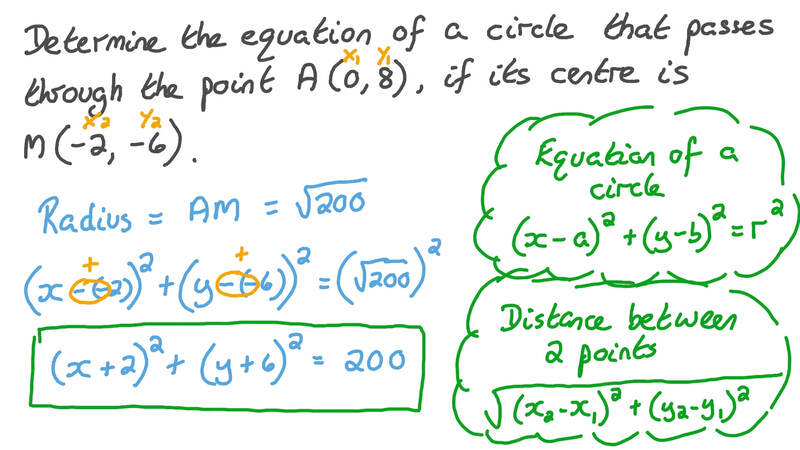 Determine the equation of a circle that passes through the point 𝐴 ( − 7 , 2 ) if its centre is 𝑀 ( − 3 , 2 ) . 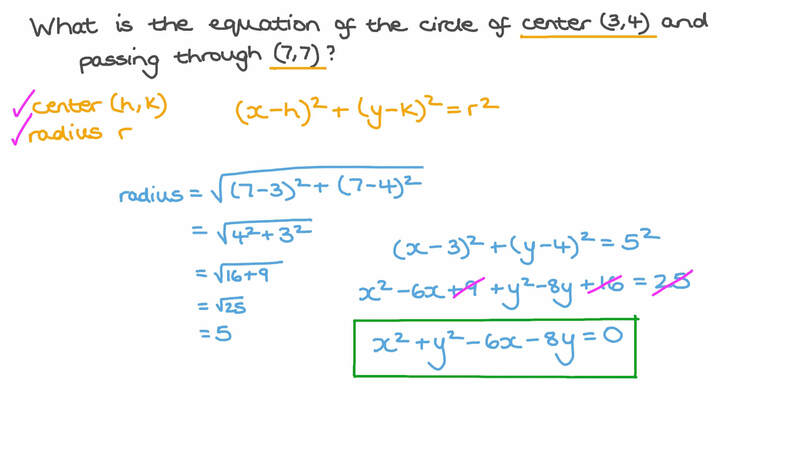 Determine the equation of a circle that passes through the point 𝐴 ( 9 , − 5 ) if its centre is 𝑀 ( − 6 , 1 0 ) .